To ensure that the touch-up color matches your vehicle's exterior finish, check for your vehicle's color code near the VIN number on the dash, on the firewall, or in your owner's manual. Be sure to inspect the scratch to make certain there isn't a dent. If there is a dent, you may need to have the scratch and dent repaired by a professional. Before you apply the paint, be sure to clean the area with warm soap and water. For optimal results, use sandpaper with a grit that is at least 220. 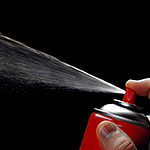 For deeper scratches, it is recommended to apply a coat of primer before the paint. Although you should still use a 220 grit sandpaper to prepare the surface, a sandpaper that is 600 grit or higher should be used to smooth the primer.